Available as a sedan or 5-door hatchback, the 2016 Chevy Sonic subcompact offers impressive room for its size, plus nifty features such as forward-collision alert, touch-screen audio display and in-car Wi-Fi. Starting at roughly $15,000, the Sonic also presents a good - but not the best - value in the short and long term. Great car for long commutes and city living, very easy to parallel park. I love how small my vehicle is, its small enough to be convenient for city living without feeling cramped. I still have enough storage space in my car despite its small size. My Sonic has been very reliable so far, and I haven't had to bring it into the shop for any repairs or services outside of its routine oil changes. I think the gas mileage for this car is pretty good, I drive a lot for my commute to work and I do not have to spend a fortune to fill up my tank. The biggest issue I have had with the Sonic so far is that it does not do great in snow and ice. 2016 Chevy sonic - a hatchback with an attitude. I selected this car because I once drove it as a rental. It has really smooth handling and can handle a tight turn, not to mention fit in small parking spaces. The other great thing is my sonic gets over 30 miles to the gallon, practically double what my truck was giving me. It's got plenty of space for my needs and has a Bluetooth radio so I can hook up Pandora. Sometimes it's the simple things in life and that's what I love about the sonic. Simple but effective. Compact car, but drives like a midsize sedan. Small compact car, but more room than appears. Economical on gas, comfortable seats and easy driving and maneuvering. Very smooth driving, feels like a larger car. No problems so far, very attractive car, looks like other sedans that are larger, and has a very deep and large trunk. The front seats don't have a console, which is the only issue that is negative, but does have cup holders for front and back seats. 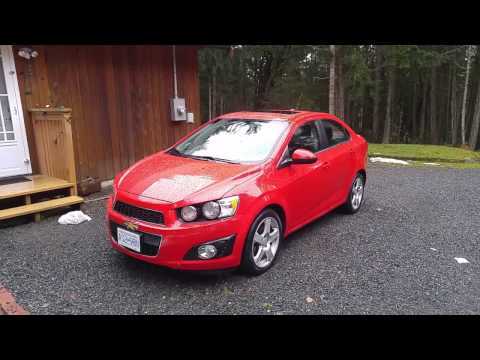 2016 Chevrolet Sonic Review, Bargain Sports Sedan?